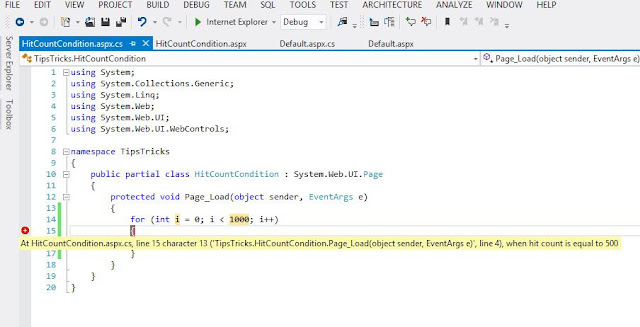 Previously in our discussion, we discussed about the concept of Conditional breakpoints. 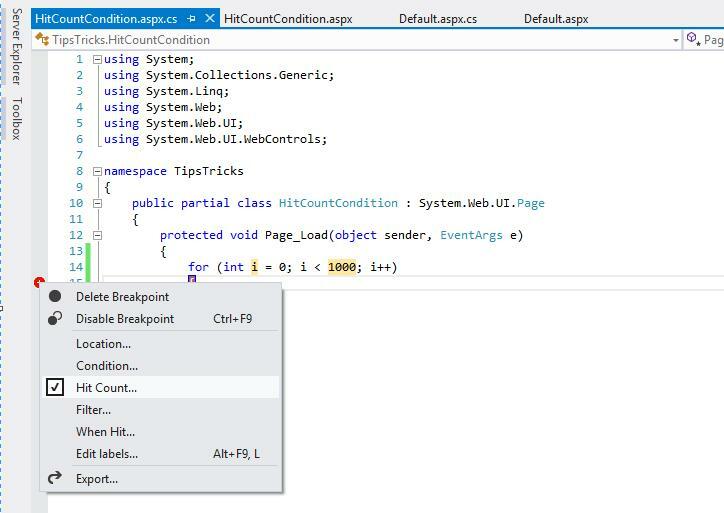 In this article, we will discuss about the Hit Condition breakpoints. Consider a case where you have a for loop with iteration of thousands of records. You know that your records at around 500th location is corrupted and you need to debug that value. Will you sit and keep pressing F5 until the record number 500 is reached ? 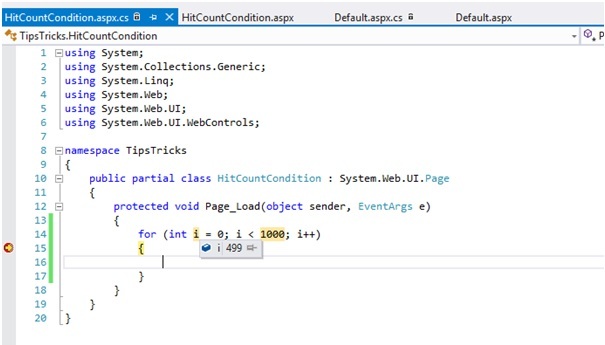 This is where you can use the concept of Hit Condition breakpoints. This is achieved by setting Hit Count condition on the breakpoint i.e. hit the breakpoint when it has iterated 499 times. Let's create a sample application to understand this. Add a for loop with iteration of 1000 records and add a condition to hit the breakpoint when the 500th record is being iterated. 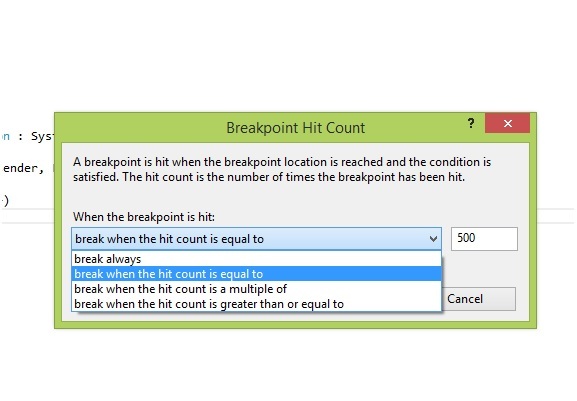 To add the condition, right click on the breakpoint and select the 'Hit Count' condition. This will open up a window where we can define a condition to hit the breakpoint only when it meets the criteria set for its execution. Here we have 4 different conditions and these are self explanatory in their details. So we select the condition 'break when the hit count is equal to' and set its value to be 500. 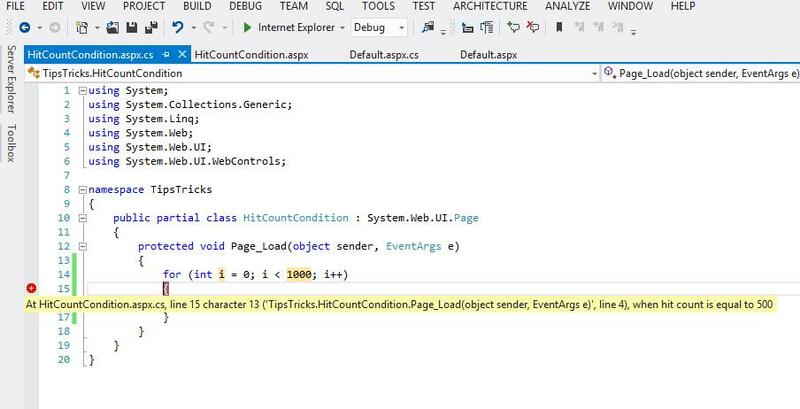 Run the application and see the value of variable 'i', when the breakpoint is hit. So here when the value of i becomes 499 (starting from 0), it is iterating the 500th record and the breakpoint gets hit. So set the break point and enjoy the debugging...!! !